People who take part in community activities are more likely to have better memory and problem-solving skills in later middle age, according to new findings from the National Child Development Study (NCDS). Researchers from the University of Southampton and University College London analysed information on more than 9,000 people born in England, Scotland and Wales during a single week in 1958, who are being followed by NCDS. When the participants were aged 33 and 50 they were asked whether they were members of community groups or organisations, such as trade unions, parent school associations, sports clubs and women’s groups. At age 50 they also completed a series of assessments to measure their memory and problem-solving ability. At age 33, only 14 per cent participated in a community activity, but this rose to 25 per cent at age 50. Those who were members of community organisations and groups at either age scored higher, on average, in the cognitive tests at age 50. Each additional activity they took part in increased their scores even further. The effect of taking part in social activities remained even when taking into account other factors that affect cognitive function. Fifty-year-olds who also had good cognitive ability at age 11 and those with better academic qualifications also scored higher in middle age, as did women and those who exercised frequently at age 42. Those whose fathers held manual jobs, and those who themselves worked in a routine occupation at age 42 scored lower, on average, in cognitive tests at 50. Worse mental health at 42 was also linked to lower cognitive scores. 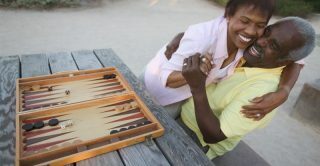 The report said: “Adult social engagement through civic activities could potentially maintain cognitive function at age 50, independently of behavioural and socio-economic circumstances. ‘Is mid-life social participation associated with cognitive function at age 50? Results from the British National Child Development Study (NCDS)’ by Ann Bowling, Jitka Pikhartova and Brian Dodgeon was published in BMC Psychology in December 2016.